FREE FORUM: RETIREMENT: A Nightmare? PART I: My Childhood As Daughter Of A Soldier. When I retired, I realized that time flies very fast. I still remember vividly how I scream loudly looking for my mommy who left me alone among strangers at my first debut at the age of three entering my kindergarten school in Kutaraja (Banda Aceh) the Northern Part of Sumatra. At that time, I might have thought, that mommy didn't have any pity on her own daughter by leaving me alone like an orphan at the kindergarten school. I remember they called me as a tearful kid for I was non stop crying waiting for my mom's hands although Kak Ida (Sister Ida) and Tante Lus (Aunt Lus) my teachers played a beautiful children song Potong Bebek Angsa or Slaught the Duck Swan in the piano and bribed me with a sack of candies that children normally loved. My first debut at the kindergarten school in Kutaraja, Aceh. We lived in Kutaraja until my age was 4; then we forced to move for a refuge to Medan, because there was a big chaos in Aceh. Daud Bereuh the Governor of Aceh rebelled in order to enact a Muslim Republic in Aceh, separated from The Republic of Indonesia. Daddy had to stay in Aceh with the Indonesian loyalist troops in which quite a number of them were also an Aceh origin. I hardly recall, how long had we been staying in a hotel in Medan or back and forth to Berastagi to stay in my dad's home town. What I remember is, we then moved to Tanjung Selamat to a military compound about 12 kilometers from Medan. Daddy joined us about a year after the situation in Aceh subsided under the control of the Republic. 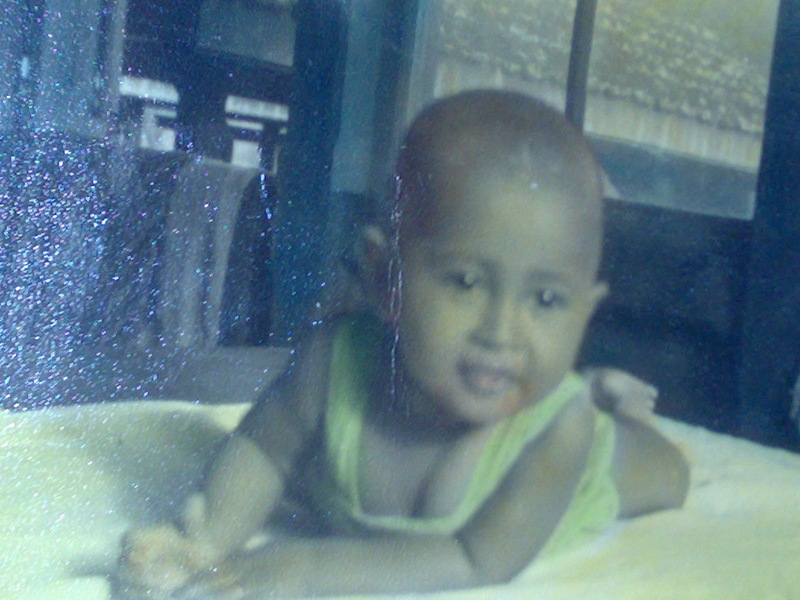 In Tanjung Selamat, I began my first elementary school until the second grade and there my mommy gave birth to my two lovely sisters; so we were five, two boys and three girls. People who didn't know our family might have thought that I was the only kid of my parents, or the youngest or the only daughter, because they always brought me wherever they go except to a funeral, a wedding or a hospital. I was reluctant to go to those three particular places, because I dislike and scared to see someone dead or ill, and so shy to go to a wedding because of inferiority complex of feeling so ugly. Yes, I felt, I looked like an alien, sometimes so fat and most of the time so skinny with protruded teeth. Because of that feeling and the teases I got from my siblings and parents, I became harmful, rebellious, arrogant and isolated at home. However, to my two little sisters I can be warmth and protective, it was just automatic, I didn't know why, even up to now, might be because they are both much nicer than my brothers. I also would always be nice to friends (boys and girls), easy going and friendly, they always took care of me and attentive. Of course there were some unfriendly friends, but in my childhood, I didn't recall of having any enemy, they were all too good to me. Growing up, I knew that, mommy changed a bit, she seemed in favor to my two sisters rather than to me, however, I had never lost the love of my daddy. I was still, obviously his favorite. I still remember, he would fulfilled whatever I asked, as long as he had money, I can always got what I want. Nonetheless, as a military man daddy always went to a battle ground. At that time, between 1950 till end of 1960s, there were lot of separative movements or rebellions in my country, so I hardly met my daddy at home, sometimes till a year or two. To meet my daddy, I recalled, my mom in the early of 1960 had to arrange a cultural performance to enable us and all of the family of the soldiers to go to the military front line to entertain my dad's battalion. She asked the permission from the commander of the Sumatra Army an approval to visit the battalion, because dad as the commandant of the Tiger Battalion (Battalion Macan Kumbang) and his troops, had long gone from home for a battle, although the distance between Medan and Rantau Perapat is only 300 kilometers. Mommy was a very smart, strong and brave woman; she was really well organize in almost everything especially in dealing with her 7 brat little kids. I wonder how she manage my dad's meager salary and educated us so well by spending so little for what her personally needs for the shake of her kids. Mommy was the best woman I have ever had in life. She was so funny, lovable and always put her children and may dad interests in the first place. 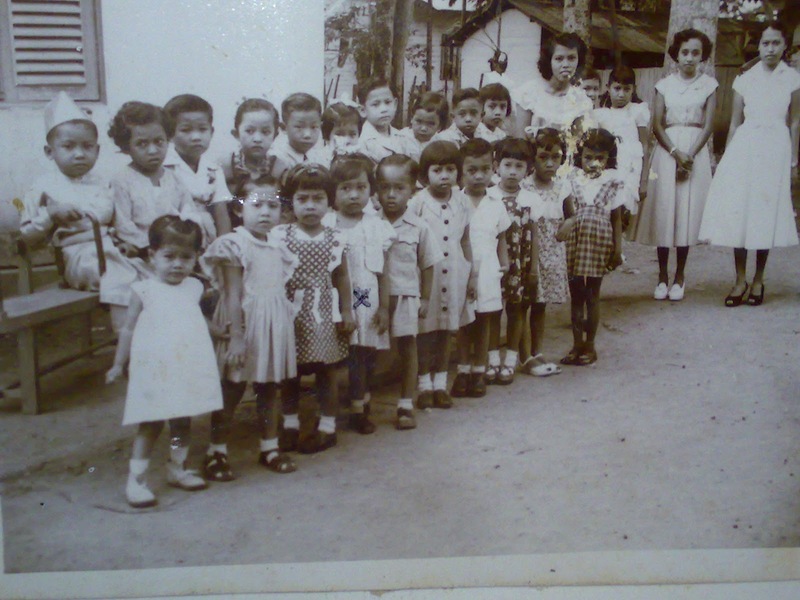 I remember when we were small (maybe around 1957) in Tanjung Selamat, some strangers came to our house and looked for my daddy. Actually, I was the first they met, but I honestly said to the strangers that daddy was not home, then mommy came out and convinced them to look for my daddy in the office not far from home, because our house was in the military compound. Mommy was so calm and full in control, she didn't show her fear though our house that time was the furthest from the office. She even offered them to drink and to allow her to call my dad. They refused the offer and left. I didn't know why the strangers then left us alone. After they gone, mommy hurriedly locked the door, gathered all of us (her five children at that time) inside of her bed room and told us to lie down on the floor and waited for her for a while. It was already late in the afternoon, we didn't know where mommy was, until she told us that she went out to report about the strangers to some soldiers who lived at the back of our house. Not long after, our house was bombarded with machine guns, I scared to death and so did my siblings seemed scared and shocked not knowing what was going on. We heard the machine guns swinging like in the battle ground. We knew the story about the revolution from our parents because mom was a nurse and dad was a soldier when they met during the revolution against Dutch colonial and the Japanese in 1940s. However, we didn't know that the Battle ground against domestic rebellion would be so horrifying and threatening. Mommy tried to keep us as quiet as possible and encouraged us to be brave because our soldiers were out there fighting against the rebellion. About half an hour, the gun shots stop and later some soldiers came and told us to stay put, because we were all well protected. They said daddy was in hide, there were big rebellions against the Republic, we had to refuge the next day. Mommy was not in good health that time. She was very ill but she had to take care of her five little children alone. We run for a refuge from Tanjung Selamat to Pulau Berayan nearby Medan in the middle of the night and lived there in a very small military house. As far as I remember, we never stay in a small house like that, a wood house with 3 small bed rooms, a very modest kitchen and a toilet; but we had to, because our state was in emergency. My mom illness became more serious, she lied on bed helplessly. I was about 8 years old and with my mom sister who sometime came, I had to take care of my mommy and my siblings. In her lame less mommy told me to take care of my siblings and abide by the step mother if one day daddy had to marry again when she is gone. I cried a lot alone and felt so very sad and lonely, I met dad only once or twice in a month, the political situation and the condition was so unstable. Later, he brought mommy to the hospital and she stayed there for months. One night, we were all brought by bus to run for a refuge to Berastagi North Sumatra (my dad's home town) 60 kilometers from Medan. Mommy was still in the hospital in Medan. We had to run away and hide ourselves in Berastagi. We didn't know the daddy's whereabouts. Later we knew that his commandant Colonel Simbolon and Lieutenant Colonel Boyke Nainggolan were in battled against the Republic. My dad under Colonel Djamin Gintings and the loyalist troops had to wait for additional helps from the Capital (Jakarta) while they re-arranged the strategy to fight against the separatist troops led by Colonel Simbolon. Indonesia was really in chaos in 1950s. So many separatists groups scattered between Aceh up to Sulawesi. They wanted to separate from the Republic of Indonesia either for reasons of religion, regional independence, cultural, or economic imbalances or whatsoever. Regardless the reasons, however, they were all failed, because until now the majority of Indonesians are united and all loyal to the Republic. For us, government could change many times, but the Republic would stand forever! We lived in Berastagi in my grandpa's house for months and all of us refrained from school. One night, some troops (in late of 1958) came and brought us to our new big house at Jalan Padang Bulan, Medan, where dad and his platoon was actually based while fighting back the rebellion. The situation was still unstable, some separatists were successfully entering our house yard where the platoon was temporarily stayed in tents. Again, gun fired swings around us but only for few minutes and the platoon had successfully pushed them away and caught them. From 1959, the Republic troops were fully in control in Medan and that time mommy gave birth to my two little brothers the number sixth and seventh. There was not much room to manoeuvre for the remaining separatist group. Not only their space to move in the mountains became much smaller, but most of them was caught by the military and some who were still hiding had to surrender either voluntarily or by force. With no support from the people of course no rebellion can survived. From 1962 everything was settled. The whole Sumatra except some part in Aceh were totally under the control of the Republic. From there on, we lived peacefully in our big house at jalan Padang Bulan Medan until we moved to our own house at jalan Hayam Wuruk, in the same city, the house that my dad bought partly from the money that he inherited from his late father who died in the revolution in late 1940s. I finished my junior high school at the age of thirteen in Medan, not as the smartest, I was just ordinary student but not dumb at all. We lived in Medan until I was about fifteenth, then we had to move to Kotabaru, Pulau Laut (Sea Island) in Kalimantan, to join my daddy who had been assigned as the commandant of a military regiment. He was a lieutenant colonel that time; and only 6 kids joining him, because the eldest (my brother and my cousin) preferred to live in Medan rather than in a small town like Kota Baru. That time, I was at the second grade of my senior high school; and in the public school where I studied, there were only 3 teachers (one for Indonesian language, one for English and one for history! ), whereas my major was math. It was really tough living in an island with such poor condition and with population might be only around 10.000 people. No facilities than 20 land rovers and trucks in the island. The island only had one medical doctor (dr. Ari Dodo) and a clinic. There were only two high school there, one was the public school where I was the student and the other was a Chinese school. We always give the ship captain and some crew a small party in our house whenever they stop by the island, we try to make them feel at home and welcome. For us and the people in the island it was nice to see big ships and visitors around. Slowly, I understand that by giving them a small party my parents were also try to introduce and educate their kids in how to live in international circle. People in Kotabaru were all very friendly and respected us, we were living on the hill in a military big house and well guarded by some soldiers. But I hated being guarded, because at any time if my friends come and visit me, they had to report to the guards first although our house had no fences and everyone actually could get in from every part of the house yard. In Indonesia, especially in the regions, they look up high to military commandants, to the mayors or the heads of the districts! Thanks God that our parents disciplined us to always live modestly and humble, they taught us to mingling with everyone and to love people, and to understand that daddy was only an ordinary soldier. He never boosted himself as the youngest son of a rich man from highland Karo, instead he told us how difficult it was living under the step mothers. He said, he only had two clothes in his childhood, although his daddy was one of the rich there in Karo and only have two sons. We lived in Kota Baru for about a year and a half. It was the most peaceful and friendly place I had ever enjoyed in life. My friends were all very nice, especially Ratna who lived next door, she was my neighbor and classmate. (I wonder where she is now). Regretfully however, our peaceful life was under threat again. At that time in 1965, there were big disturbances in our country. Members of the Communists Party (PKI/Partai Komunis Indonesia) had brutally killed 6 of our military generals with an accused that they would organize a coup de tat against President Soekarno and that they were members of the “ Council Generals” (Dewan Jenderal) who planned to take over the presidency. The situation was really unstable. The Air Force and Cakra Birawa (the president's special guards) took side with the communists party. Many military men and dignitaries in major parts of Indonesia were killed. Once again, bloodshed dripping wet our beloved land. The state was in emergency, because of the civil war created by the communist party. The occurrence known as “G 30 PKI” (Gerakan 30 September Partai Komunis Indonesia or the 30 September Movement of Indonesian Communist Party); which was indicated to had been fully supported by the People of the Republic of China and the Soviet Union. Once again; our country was in great danger, as the consequence of the Cold War! Soekarno, the first President was reluctantly condemn the communist party for the reasons of national stability and maintaining secularism. He said, he didn't want to see the country in turmoil. As the results of his stubbornness and by the force of the students demonstrations, the communist party and the Cakra Birawa were desolated, the life long President Soekarno who had governed the country for 20 years had to withdrawn from the presidency and had been in house detained till he died in 21st June 1970, because of high blood pressure and kidney ailment. What a tragic for such a great leader like him. On 1st October 1965, in mid of the celebration of the anniversary of the People of the Republic of China, held at the Chinese School Kotabaru, my dad rushed home, he immediately held an emergency meeting with his staff. When he arrived home, I inform him what I heard from Radio Australia that there was a big chaos in Jakarta, the radio talked about the General Council and the missing of some of Indonesian generals. I told him that I didn't fully understand what the radio had said. The next day and days after days, daddy seemed so extremely busy. I knew then that many members of the communist party were detained. The Chinese school was closed and desolated. My daddy taught me the politics and the need to fully understand the history, the back ground of each political party and to put the love on our country above all of our interests. He said, in order to achieve the objective, most of the political party using force and sometimes so cruel and sneaky. He never said to any of his kids not to involve in the politics or the arm forces. However he always said that he would be happy if we could just be a doctor, an engineer, a civil servant or a businessman like his dad. As a military man, of course he was not a partisan of any political party. Once, I asked him whether he had any fear whenever he was in the battle ground, he said yes, especially after he had 7 of us but had to defense the country in the battle ground. He said he always had to be more cautious and in full coordination with all of his soldier friends in order to be able to arrive home safely. Daddy was always in the military infantry when he was young, up to the age of late 40. Then when the situation is more stable, from 1970 till his retirement he was in the staff position. He ended up his career as a colonel for 12 years. A very honest man that I always love and respect. I knew how disappointed he was to his military career. But it was always difficult for a Christian and an honest person to have a career in a country with Muslim majority; only one or two could be successfully either because that person is peculiarly smart or “smart” in negatively connotation! As Indonesians, we would always be loyal to our nation though unfairness remain in tag in this islands country. However, I strongly suggest that the issues of differences have to be cautiously and wisely addressed and revived, to strengthen and empowering Indonesia! It is amazing to read your story. What a life you have had. Thank you so much for sharing your story with us!! I love the photos you've added to the article. I would so love to visit Indonesia, not for all the beauty I know can be found, but for all of it. Thanks again for sharing, and thank you for your continued support and encouragement you've given me in these past 1.5 years on my blog.